Many believe SEO is all about Google. And why shouldn’t they, as Google happens to be the leading search engine with possession over more than 70% of the search market share? Bing, which gives the biggest competition to Google, has an overall global share of just 7.91% which makes it almost 10 times smaller than its rival. But between Google and Bing, there is YouTube, which has earned the reputation of being the second largest search engine in the world. Every month, YouTube processes more than 3 billion searches and interestingly, every second internet user is available on YouTube, which has become the fastest-growing video-sharing platform across the globe and is significantly bigger than Bing, AOL, Yahoo, and Ask put together. YouTube does not know what your video is all about. Making an impeccable video is important but it won’t serve any purpose unless people are able to find it. The only arsenal you have to make it findable is to write a compelling title and an equally detailed description, with all the primary keywords subtly inserted into both. When it comes to titles, YouTube imposes a limit of 100 characters; however, any title exceeding 66 characters will get truncated. Needless to say, good use of keywords does not at all mean keyword stuffing, which is a big no-no as it would do more harm than good. The number of videos uploaded every day on YouTube is simply overwhelming. In fact, every minute, more than 300 hours of videos make their way to this video-sharing platform. The sheer volume of addition to an already massive playlist makes it all the more difficult for videos to rank higher in search results. Besides, YouTube’s algorithm gives preference to newer content compared to older ones. The short window of preference given by YouTube lasts anywhere between 24 hours to 3 months and this makes pushing new content, at a fairly higher frequency, more desirable from SEO point of view. Often, tagging is considered as a tool or a way to inform viewers about the genre of a video. However, this is equally important in the case of YouTube too as it helps the platform understand the content of a video better, so that it can be played together with other videos of similar content. This actually increases the reach of a video, as YouTube plays videos automatically based on what users have last watched or searched. However, make sure you are not using the wrong tags just to spike up your ranking as Google may penalize you for this. What is true for tags is true for categories too. 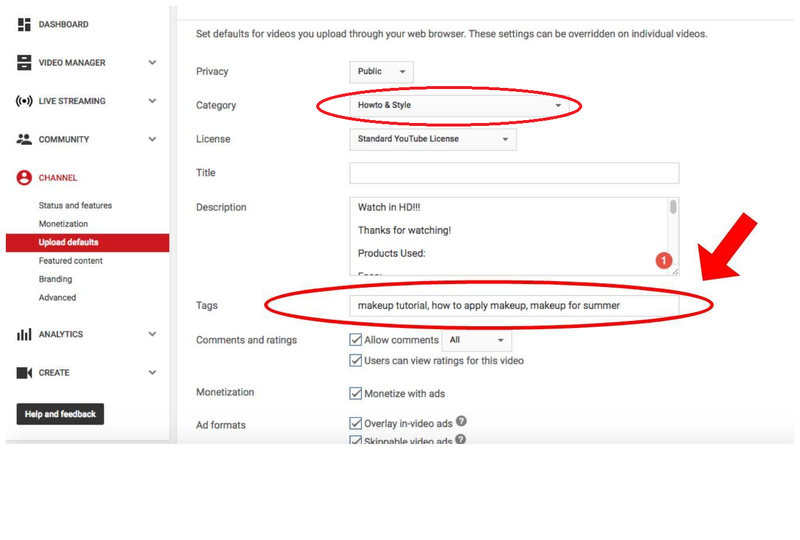 You can categorize a video under “Advanced Settings” and this will make your video appear in search results having similar categories. Though it does not play a straightforward role in scaling up the ranking of your video, it works indirectly. A thumbnail acts as your primary weapon in making a user gravitate towards it and click it. The more enticing a thumbnail is, the better will be its chances of getting clicked. However, the role of a thumbnails is not restricted to just attracting a user. In fact, as the number of views begins to rise, YouTube’s algorithm begins to give the video in question a higher ranking. The simple formula is more views = more visibility. So, we see how a good and captivating thumbnail indirectly helps in increasing the search rankings of a video. To sum it all up, leaving your YouTube channel to fend for itself without investing properly in its SEO may prove to be detrimental to your business in the long run. By employing the above-mentioned simple techniques, you may end up increasing the visibility of your videos manifold.